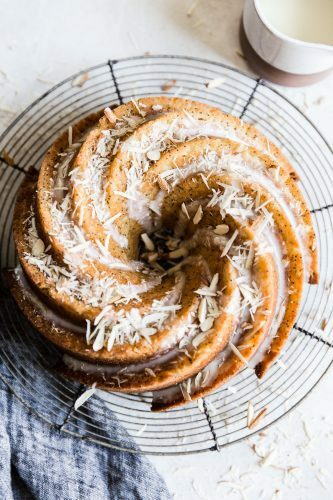 This flavorful bundt cake made with poppy seeds is bursting with almond goodness. It’s moist, delicious and comes together quick, with very little effort. Hi Friends! Natalie here from The Modern Proper to discuss my favorite flavor combination when it comes to sweets: almond and poppy seed! The two go together like bread and butter and I just can’t get enough. 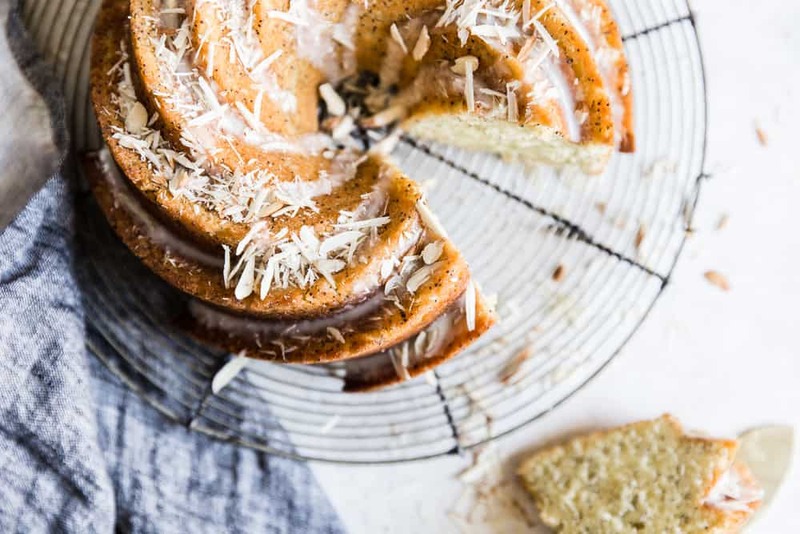 If you share my affinity for this perfect flavor combo then I can guarantee that you’re going to love the recipe I’m sharing today for almond poppyseed bundt cake. Out of principle I purchased a bundt pan shortly after I got married. I mean, every house needs a bundt pan, right? I pictured myself making oodles of baked goods once I had my own kitchen, but as it turned out I’m not much of a baker. Although I do make this beautiful Bailey’s Chocolate Bundt Cake often (it’s a fave). I’m sad to say that bundt pan sat unused, collecting dust in the cupboard for years. 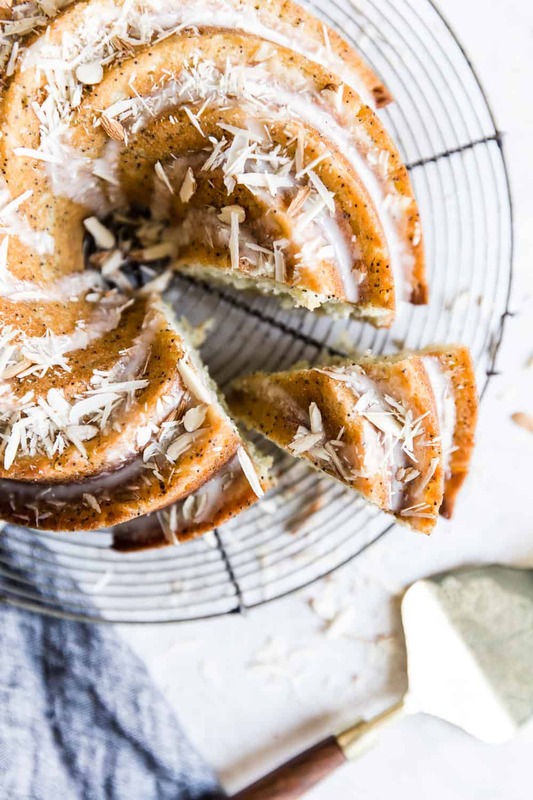 It wasn’t until recently that I discovered bundt cakes, especially this almond poppy seed one, are one of the easiest (and most impressive) kind of baked goods to successfully pull off. For people like me (and maybe you) who enjoy fast recipes with little effort, easy to find ingredients, and perfect results, this bundt cake is sure to become your new best friend. And the best part is that if you get a pretty bundt pan then the decorating is already done for you! There are one thousand and one bundt cake recipes out there (this Bailey’s Chocolate Bundt Cake being one of our faves), but in the end all you need is lots of eggs, lots of sugar, lots of butter, buttermilk, and in the case of this recipe…lots and lots of almond flavor. For extra almondy goodness I’ve combined almond extract and almond paste (I just love almonds that much), which provides plenty of the nutty sweetness I crave. Combine with poppy seeds for texture, flavor, and visual appeal and you’ve got yourself a perfectly dense, moist and delicious dessert or breakfast pastry, ideal for pairing with a great cup of coffee. If coffee isn’t your jam, then just go ahead and opt for it topped with strawberries and whipped cream. Yum! If you like me are really into the flavor of almonds you would also love this Almond Peach Bread Pudding. 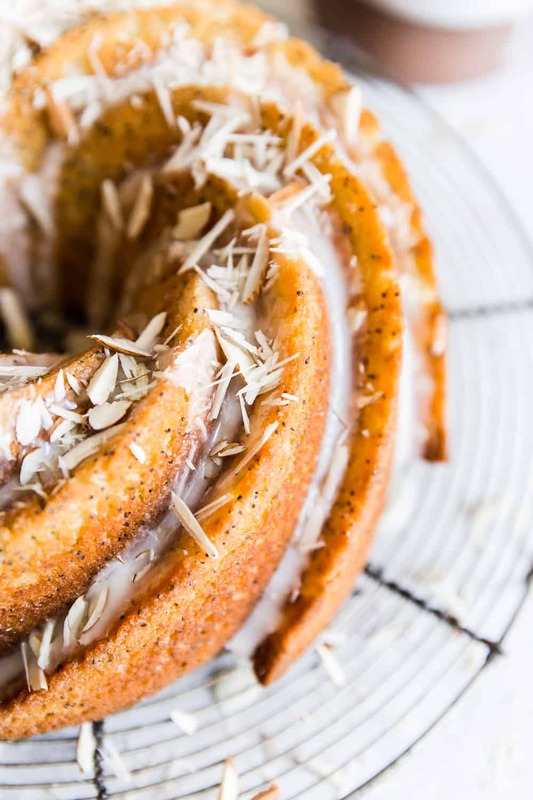 This flavorful bundt cake made with poppy seeds is bursting with almond flavor. It's moist, delicious and comes together quick with very little effort. In a large bowl combine flour, baking powder, poppy seeds and salt. Set aside. Using a stand mixer or hand blender blend sugar and butter until light and fluffy. Add in eggs and continue mixing until fully combined, scraping down the sides as needed. Add in almond paste and extract and blend until smooth. Once smooth add in buttermilk and blend until fully incorporated. With the mixer on low speed add in flour mixture and stir until smooth. Pour finished batter into a well greased bundt pan and place on the center rack. Bake cake for 50-60 minutes or until cooked through. Allow cake to cool completely before removing from pan. Top with glaze and slivered almonds and enjoy! I want to make this this weekend, could this recipe be made in a 9×13 cake pan. ?